Last week, a visit to the Public Safety Training Center that’s currently under construction represented another first for me! I happened to be there on the day that three rail car tankers were being moved on site to create one of our outdoor training props—a tanker car derailment. These tank cars had the capability of transporting several different products such as ammonia and chlorine. The cars came from Indiana and were formerly owned by the Canadian National Railroad. We purchased two of them and the third was donated by the Ergman Corporation, a scrap dealership from Lake Bluff, Illinois. A huge Miron crane positions one of the rail cars at our new Public Safety Training Center. Each of these rail cars is 60 ft. long and weighs 65,000 lbs. empty. 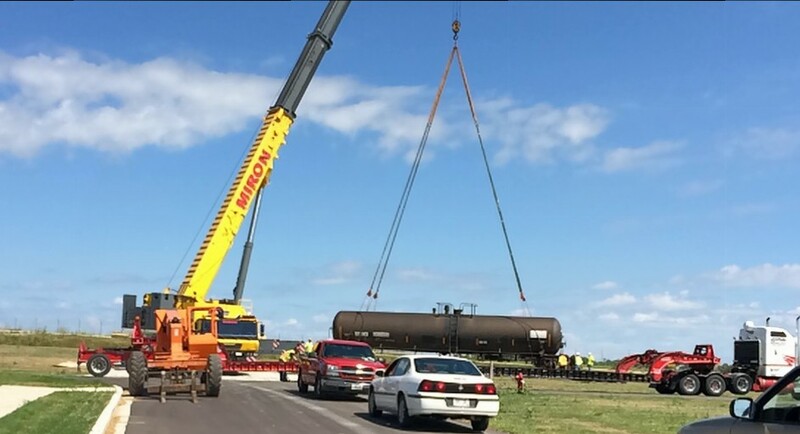 They were each lifted by crane from a rail spur in downtown Appleton and transported by about a 70 ft. trailer bed to the PSTC site at the airport. When I was visiting, the enormous Miron Construction crane was lifting one of the cars from the truck transport onto the tracks that had been laid for this prop. It was magnificent to see this thing dangle in midair! What was truly amazing was to see this tanker right next to our FedEx Boeing 727 aircraft prop. The tanker car’s circumference actually was larger than the fuselage of that airplane! As I was working in my landscape this weekend, I was thinking about a state report that I read last week on technical college enrollments by various disciplines. One fact in all of these numbers really stood out to me. FVTC serves 25% of the total student enrollment in Agriculture within the 16 colleges of the Wisconsin Technical College System. I’ve always known we’ve had a strong program, but supporting Wisconsin’s ag industry with one quarter of the WTCS total enrollment is pretty incredible. 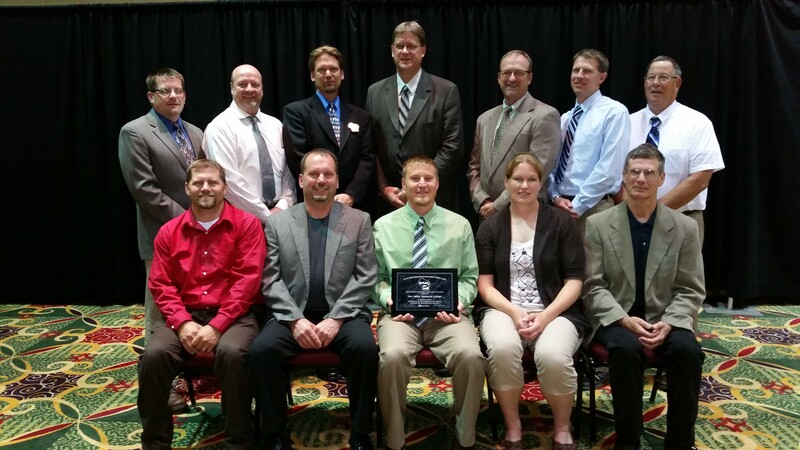 Speaking of our ag programs being strong, earlier this summer our faculty and staff in the Agriculture Department were honored by the Wisconsin Association of Agriculture Educators (WAAE) with the 2014 Outstanding Post-Secondary Agriculture Program Award at their state conference. Congratulations to this great team! We are very proud of your work and your collective accomplishments. Members of FVTC’s Ag team gathered to receive their state award. Front row L to R: Tim Duel, Tom Yost, Jason Fischer, Sara Maass-Pate, Lynn Jerrett. Back row L to R: Joe Sinkula, Randy Tenpas, Jeremy Hanson, Mike Cattelino, Dale Drees, Nick Schneider, Kevin Rauchholz. Not pictured: Jim Beard, Roxanne Rusch-Olesen, Corey Lee, Jerry Fischer, Nancy Buchholtz. I look at both quantity and quality when I think about the powerhouse our ag department really represents. The quality recognition comes in the form of the WAAE award, which was based on our student employment outcomes, the department’s commitment to advanced technology, and the outstanding industry partnerships they’ve formed with companies such as Case IH, Service Motor Company, and others. The quantity factor comes by serving so many students who are clearly finding value and opportunity through these programs in an industry with significant need for technicians and operators. Just as my landscape and gardening work never seems to be done, we have much to do to support our agriculture industry! I can’t think of a stronger team to lead the way.